Tasted blind at the Burgundy 2012 tasting in Beaune. 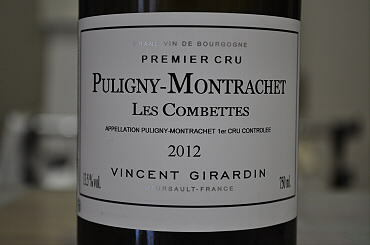 The 2012 Puligny Montrachet 1er Cru Combottes from Vincent Girardin might be one of his best offerings in this vintage. It has tropical tones on the nose, peaches and cream that ebb with aeration, veering towards more resinous, almost waxy notes with aeration. The palate is ripe on the entry with well-judged acidity. There is clearly impressive weight in the mouth, a more phenolic and slightly worked Puligny, but there the finish shows great tension and intensity. I would afford this Combottes another year or two in bottle and you'll have a serious wine. 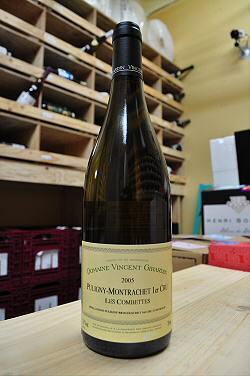 The Girardin 2007 Puligny-Montrachet Les Combettes adds musk melon to the predictable repertoire of peach and lemon, offering an especially flatteringly creamy texture that ? as with other of the best 2007s ? by no means precludes vivacity or refreshment. Wafting floral perfume and underlying nut oil and malt richness contribute to the allure. But there is plenty of mineral depth here, too ? suggestive inter alia of oyster liquor and shrimp shell ? that sets up a dynamic interaction with the wine's abundant fruit. This finishes with a tug on the salivary glands, stomach, and imagination alike. I would anticipate close to a decade's intrigue and enjoyment, perhaps more. Girardin is keen to emphasize his being the sold proprietor with more than one parcel in Combettes, as he believes the two he owns ? at the northern and southern extremes of the site ? offer unique complementarity.